In the Detroit of the late-eighties/early nineties, there existed bands faithful to the principalIn the Detroit of the late-eighties/early nineties, there existed bands faithful to the principals laid out by the pantheon of musicians who gave the Motor City its enduring legacy: The legacy of Funkadelic, the MC5, and The Stooges. Mule was one of those bands. The seminal, country-metal trio forged out of the wreckage of Laughing Hyenas (bassist Kevin Munro and drummer Jim Kimball) and Wig (front man and guitar player P.W. Long) gave us three bone-jarring, marrow-roiling discs between 1991-94 to help us just not give a damn if the world didn�t understand us. For reasons still unclear, the band relocated to Philadelphia in 1994 and Mule began to play fewer shows while P.W. began to play more solo gigs. He left the band in spring of �96 and soon phoned drummer Mac McNeilly, who had recently left Chicago�s proto-organo-industrial phenomenon The Jesus Lizard. Long and McNeilly released two CDs--We Didn�t See You on Sunday (�97) and Push Me Again (�98)--under the name P.W. Long�s Reelfoot on Touch and Go Records. On �Sunday, Long relied less on the bombast employed by Mule and more on direct human engagement and vulnerable storytelling. Push� was another story all together, where Long and McNeilly, joined by Boss Hog keyboardist Mark Boyce, pulled out all the rock stops, ripping through eleven songs of accomplished Roxy Music/early-Parliament level album-craft. 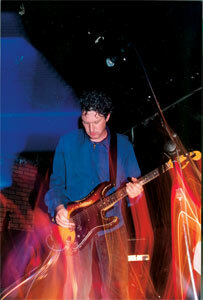 Long continued to tour North America both with a band and as a solo artist, sharing bills with bands ranging from Firewater and Don Caballero to Freakwater and Richard Buckner. Then he just stopped showing up. Since leaving Detroit in �94, P.W., it seems, has never really settled on a new home. He tried New Orleans for a couple years around the millennium, where he would stay up all night lurking under the dark trees and then complain about the heat all day. Aside from a few stray gigs, the only record of any activity was when P.W. got in the director�s chair to shoot a video of the song �You�re the Reason� for Nashville pal Hank Williams III, which ended up airing nightly on CMT throughout the summer of 2000. Then it was on to New York City where he was a restaurant and nightclub critic for the cheeky London-based Crush Guide. In NYC he also wrote the occasional CD review while pitching program ideas to bewildered TV networks. P.W. forwent his television pursuits to hole up in Buffalo, New York, where he threw in with returning expatriate Muscovites and founders of Moscow�s Exile when they embarked on their next project, The Buffalo Beast. P.W. served as news/sports reporter, raconteur, and wrote a column from the viewpoint of a buxom, bi-sexual, violent, factory-working girl for the humor/prank paper. In 2002, the boys from Shellac tracked down P.W. and invited him to All Tomorrow�s Parties music festival in Rye, England, to share a stage with the likes of Wire, The Fall, Will Oldham and scores of other bands from around the world. While there he began discussing another potential record with the folks at his old label. The record was completed and titled Remembered (released 2003). A tour followed in the wake of the release. P.W currently lives in Texas from where he writes a column on the NBA for the weekly New York Sports Express. He also regularly plays in an alter-ego band with guitarist Kirkland James and drummer Taylor Young called Young James Long. -Lenard Johnss laid out by the pantheon of musicians who gave the Motor City its enduring legacy: The legacy of Funkadelic, the MC5, and The Stooges. Mule was one of those bands. The seminal, country-metal trio forged out of the wreckage of Laughing Hyenas (bassist Kevin Munro and drummer Jim Kimball) and Wig (front man and guitar player P.W. Long) gave us three bone-jarring, marrow-roiling discs between 1991-94 to help us just not give a damn if the world didn�t understand us. For reasons still unclear, the band relocated to Philadelphia in 1994 and Mule began to play fewer shows while P.W. began to play more solo gigs. He left the band in spring of �96 and soon phoned drummer Mac McNeilly, who had recently left Chicago�s proto-organo-industrial phenomenon The Jesus Lizard.